Exteriors - Traditional - Exterior - Miami - by B&M Building Co.
Front door - House is perfect Could you give me info on where door was purchased? Hi, thanks for the question. 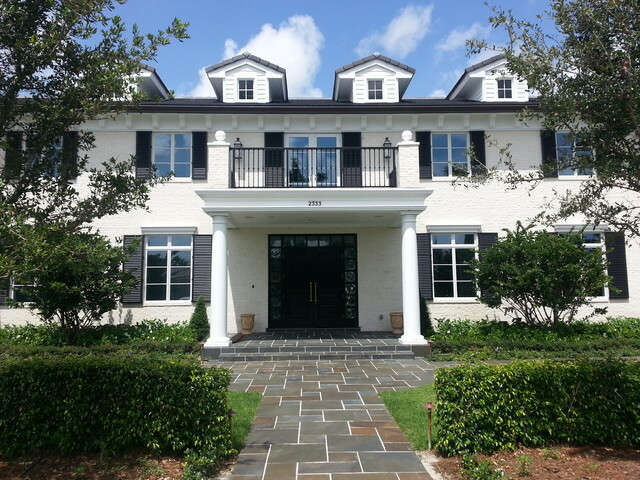 This front entry was custom built in West Palm Beach, FL by Woodmill Designs. Exterior paint color - Would you mind sharing the exterior paint color? The body color of this house is made up of Diamond White modular brick, so no paint necessary except for the trim. Thanks, the walks and driveways are Bluestone. We had them shipped to Boca Raton from Endless Mountain Stone Company in Pennsylvania. We mudset the stone and used a white grout for contrast. details for front porch - do you have any details on crown molding used on front porch? I am building a porch like this and need help with molding design. Also, how wide are the columns? Beautiful!! Thank you! The columns are 16" in diameter. I don't remember the exact profile on the crown molding, it's custom made from light weight concrete and has a gutter molded into the top side of it. Shoot me an email if your interested in more detail. Glass on front door - Everything about this house is perfect I saw that the door was custom built. Can you give me info on the glass around it?